Now this is something I didn't expect from Angel Deradoorian. An artist previously confined to the parameters of Art Pop branching out into the cold, dark abyss of desolate Ambient Pop. 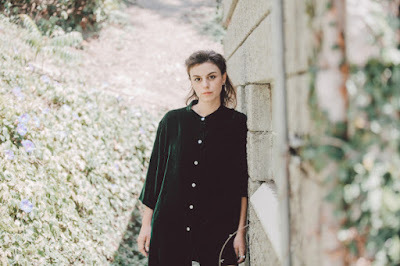 On Eternal Recurrence, Deradoorian flexes her creative muscles, fearless of something new and potentially off-putting, by dropping the claustrophobic instrumentation of 2015's The Expanding Flower Planet. Long gone are the days of spastic synths and the forced vocal rollercoaster, as Deradoorian settles herself onto a slab of ice adrift in the arctic. Eternal Recurrence aims to be a transitory piece, lingering in the shadows of 'Ausar Temple[s]' and 'Mountainside[s],' shaking and swaying not from standard production choices, but from the harsh wind and uncontrollable waves. It's certainly one of 2017's most atmospheric projects, EP or not. Borrowing from the almost undefinable stature of Nico's Avant-Folk trilogy, Bjork's Vespertine, and Kate Bush's 50 Words For Snow, Eternal Recurrence stands against some lofty competition in the wake of a quiet and therapeutic exile. Problem being, it's not entertaining. I'd pontificate "at all," but 'Mirrorman' corrects the tedium with a heavy dose of haunting beauty. Truth be told, two of those three inspirations I disliked as well, Nico withstanding based purely on her uncompromising nature and enthralling surrealism. Eternal Recurrence finds that balance between the others, Vespertine and 50 Words For Snow, in that it excels conceptually but fails to drag me in when there's better, more alluring treasures elsewhere. Why join Deradoorian adrift in the dark, sightless Arctic ocean when I hate cold weather to begin with? Sure, her vocals are mediative and prepossessing, as seen on the foreboding 'Return-Transcend,' but even she recognizes the dead of air, the nip of sea. The slight melody found on 'Nia In The Dark' or the wistful Jazz of 'Mountainside' can't make up for the ponderous sulk, a problem for my overzealous mind. For some unexplainable reason though, 'Mirrorman' scratches the itch Deradoorian set. The looming synths and chilling bass, along with Deradoorian's fantastical lyrics and elongated melody works all too well. In reality, Eternal Recurrence does as well. It's just not my cup of tea.